Florida Court Forms continues to add and update its pages on a regular basis. This blog will help you stay current with the changing nature of Florida Law and this website. Continue reading "Changing Child Support Amount Due to Increase in Income"
Learn about Florida adoption forms: What forms are available, how and when to use them. 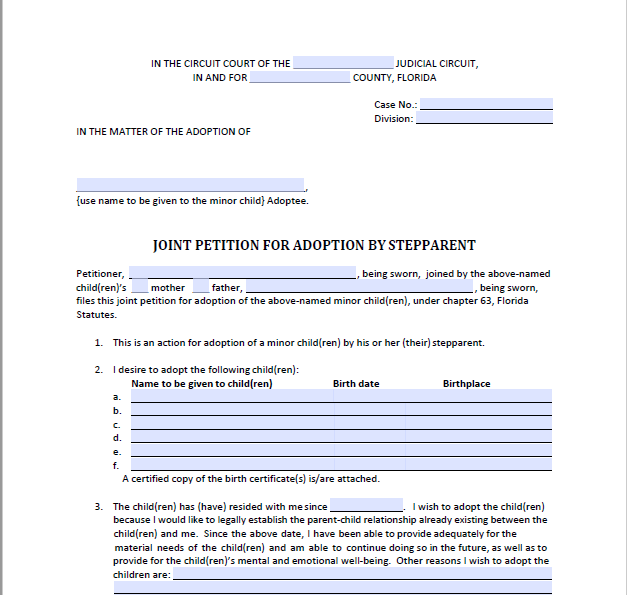 Continue reading "Florida Adoption Forms: A List of Forms and Instructions"
Adult Adoption Forms in Florida - How to adopt your adult stepchild. 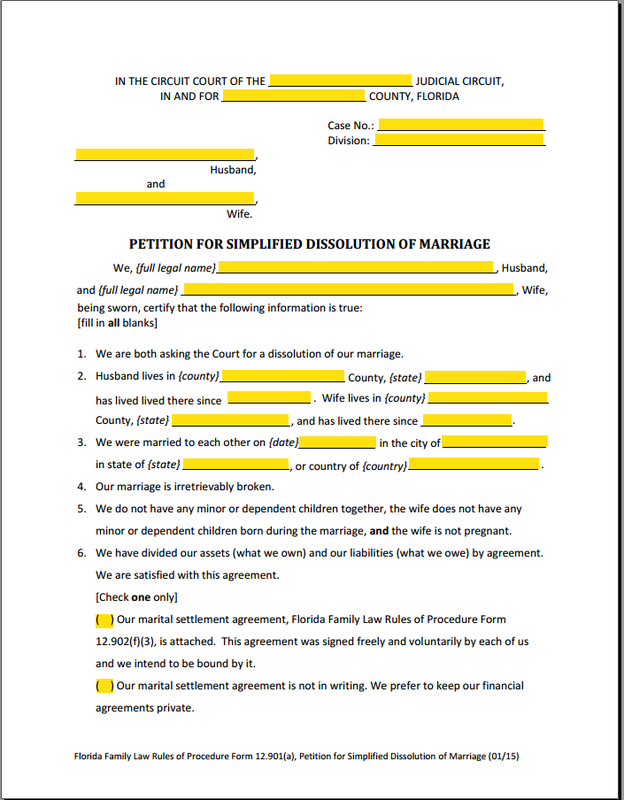 Adult adoption forms and procedure in Florida. We explain the process to file a Petition for Adoption of an Adult by Stepparent, with links to supporting forms. 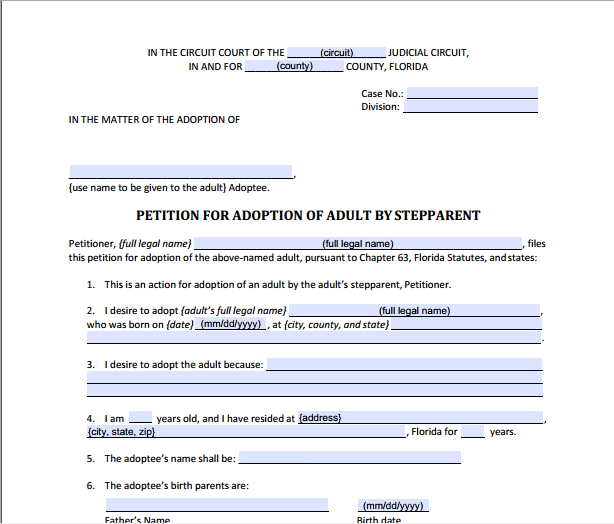 Continue reading "Adult Adoption Forms in Florida - How to adopt your adult stepchild." 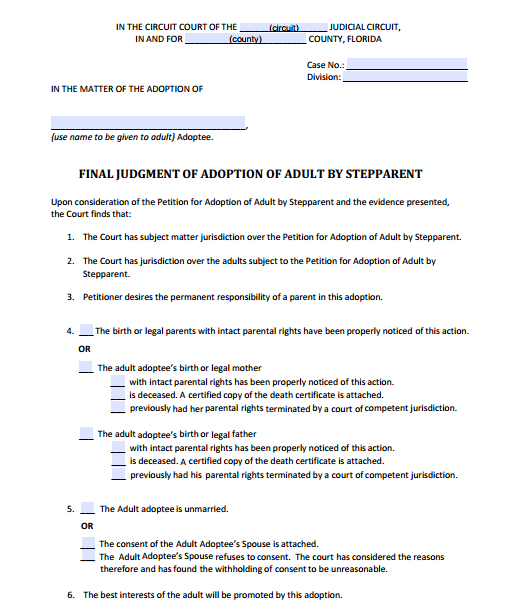 Adult Adoption Forms Packet (Stepparent). Over 15 Fillable Forms, Checklist, and Step by Step Filing Instructions. 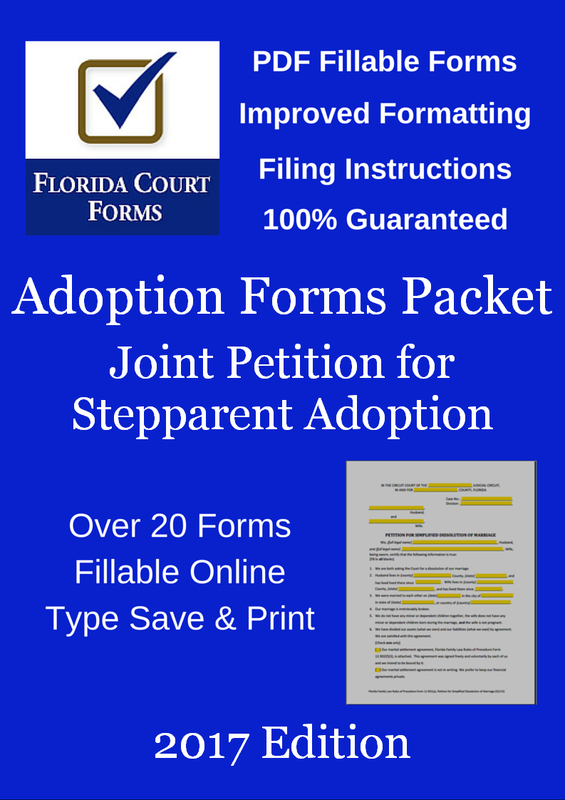 Continue reading "Adult Adoption Forms Packet (Stepparent) with Fillable Forms and Instructions"
Continue reading "Fillable Form 12.981(c)(3) - Final Judgment of Adoption of Adult by Stepparent"
Continue reading "Florida Family Law Forms - Interactive Fillable Family Law Forms in PDF"
PDF Fillable Stepparent Adoption Forms Packet. Over 20 Fillable Forms, Checklist, and Step by Step Filing Instructions. 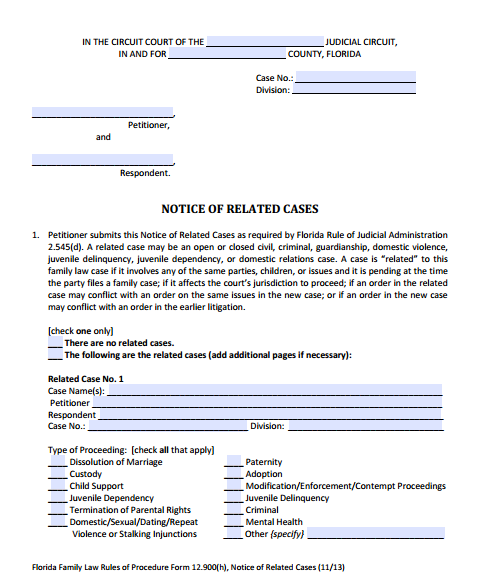 Continue reading "Stepparent Adoption Forms Packet with PDF Fillable Forms and Instructions"
PDF Fillable Form 12.900(h) Notice of Related Cases. Fill in the blanks, save, and print. Continue reading "PDF Fillable Form 12.900(h) Notice of Related Cases"
What forms do I need to file for summary administration and where do I file them? Ask the staff questions and get answers. Continue reading "Forms for Florida Summary Administration - Probate Law"
Stepparent adoption forms and procedure in Florida. 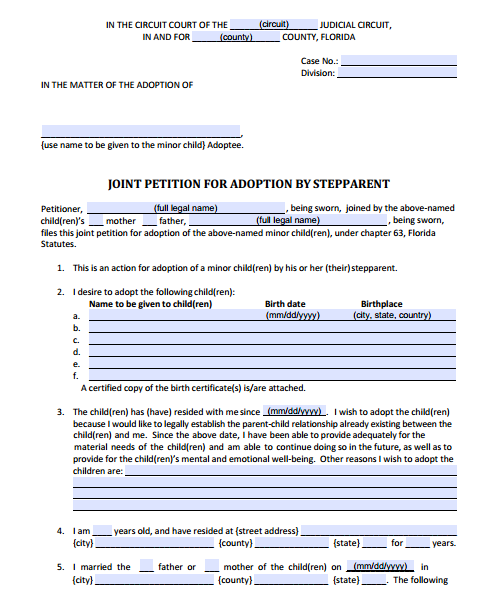 We explain the process to file the Joint Petition for Adoption by Stepparent, Form 12.981b1 with links to supporting forms. Continue reading "Stepparent Adoption Forms in Florida - Learn how to adopt your stepchild"
A selection of frequently asked Florida adoption questions answered by our friendly staff. Continue reading "Florida Adoption FAQs - Frequently Asked Questions and Answers"
PDF Fillable Divorce Forms Packets for Dissolution of Marriage in Florida with Step by Step Filing Instructions. 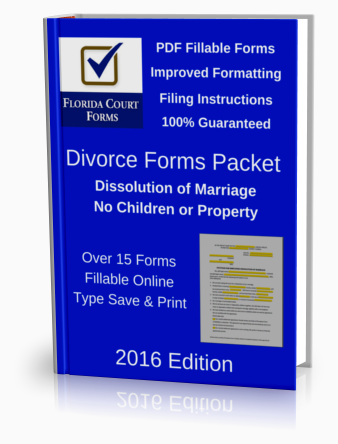 Continue reading "PDF Fillable Divorce Forms Packets for Dissolution of Marriage in Florida"
Need Help? Follow Along As We Explain the Divorce No Children Form 12.901(b)(3) in Plain English. Includes Filing Procedures & Links. Continue reading "Form 12.901b3 Petition Dissolution of Marriage No Children or Property Explained"
Need Help? Follow along as we Explain the Divorce with Children Form 12.901(b)(1) in Plain English. Includes Filing Procedures & Links. Continue reading "Form 12.901(b)(1) Petition for Divorce With Children Explained"
Need Help? Follow Along As We Explain the Divorce With Property but No Children Form 12.901(b)(2) in Plain English. Includes Filing Procedures & Links. Continue reading "Form 12.901b2 - Dissolution of Marriage with Property But No Children Explained"
PDF Fillable Family Law Forms Packet. Divorce With Children. Over 20 Fillable Forms, Checklist, and Step by Step Filing Instructions. 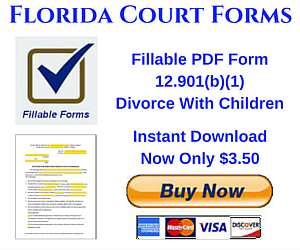 Continue reading "PDF Fillable Divorce Forms Packet: Dissolution of Marriage With Children"
Learn which Florida divorce forms to file. We'll help you select the right form to use for do it yourself (DIY) divorce in Florida. Continue reading "Choosing Florida Divorce Forms to File - An Easy Guide"
PDF Fillable Divorce Forms Packet With Property But No Children Uncontested. Over 15 Fillable Forms and Step by Step Instructions. Continue reading "Premium Divorce Forms Packet Dissolution of Marriage with Property No Children"
Florida Court Forms: Learn about procedures & forms for common legal issues in Florida including divorce, child support, custody, visitation, adoption, and more for self represented pro-se litigants. Continue reading "Florida Court Forms - Legal Forms for the Self Represented"
Need help? Follow along as we explain the simplified divorce form 12.901(a) in plain English. Includes filing procedures & links. Continue reading "Form 12.901(a) Petition for Simplified Divorce Explained"
PDF Fillable Divorce Forms Packet No Children or Property Uncontested. Over 15 Fillable Forms and Step by Step Instructions. Continue reading "Premium Divorce Forms Packet No Children or Property"
Continue reading "Legal Access in Florida"
A visitor from Florida asks how he could proceed after receiving a Motion for Civil Contempt and Enforcement from his ex for child support. You ask, we answer. Florida Court Forms. Continue reading "Florida Motion for Contempt and Enforcement"
Jessica, a visitor from Orlando asks how she can have the father of her child voluntarily terminate parental rights. You ask and we answer. Florida Court Forms. Continue reading "Voluntarily Terminate Parental Rights"
A visitor from Hillsborough County asks how to adopt their grandchild as they already have temporary custody. You ask and we answer. Florida Court Forms. Continue reading "Adopt Grandchild in Florida"
A visitor from Panama City asks how to schedule a family law hearing and if he needs to file a motion. You ask, and we answer. Florida Court Forms. Continue reading "Scheduling a Family Law Hearing"
Jennifer asks about the forms she needs and the procedure to file for a stepparent adoption in Baker county, Florida. You ask and we answer. Florida Court Forms. Continue reading "Filing Stepparent Adoption Forms"
We discuss the law surrounding the Florida living will. Learn the legislature's intent for a healthcare directive and the meaning of key concepts. 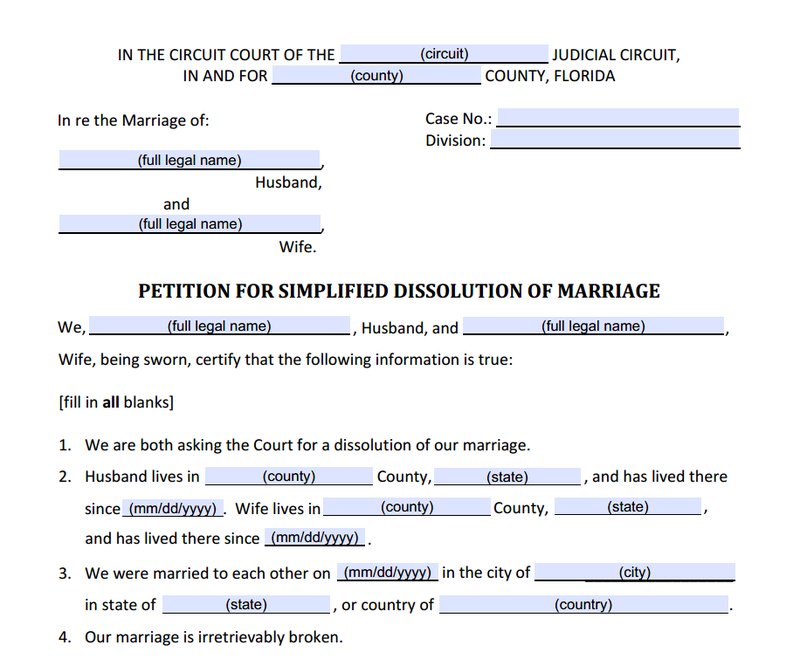 Continue reading "Florida Living Will - Laws and Information"
Choosing the right divorce answer form also known as the answer to petition for dissolution of marriage form in Florida is explained with links to the forms. Continue reading "Divorce Answer Forms - Answering Florida Divorce Petitions"
We discuss grandparent visitation laws and rights in Florida. Learn what the Florida Senate has said about visitation rights grandparents have with their grandchildren. Continue reading "Florida Grandparent Visitation Rights"